In a nutshell: Mental, fun and very, very funny. There’s something lovely about sharing a laugh with someone – siblings sharing a chuckle over a parent’s well-known habits, children’s bubbling mirth at something wonderfully silly, friends’ raucous, dirty giggling on a night out. 21 Jump Street is the kind of movie best served up in a group, preferably with beer and nachos, because when films comes this funny, you’ll want to share the laughter with friends. Written by the formerly chubby and always lovable Jonah Hill and writer Michael Bacall, 21 Jump Street takes a rather beloved, albeit worn-out movie premise (adults coping with modern day high school, and somehow manages to make it fresh and, delightfully, both madcap and tongue- in-cheek all at the same time. The adults in question are new cops, former school nerd Schmidt (Hill) and former school jock Jenko (Channing Tatum). 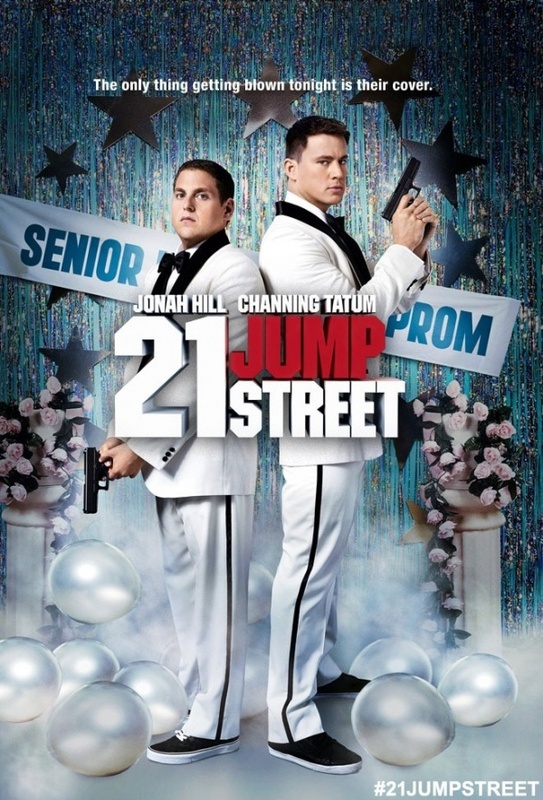 Assigned to 21 Jump Street, a specialist division, the fresh faced duo are tasked with infiltrating a local high school by posing as students and uncovering the dealers and suppliers of a new, lethal, designer drug. As I said, not exactly a new idea in movie land, but somehow 21 Jump Street manages to pull it off, giving us a smart and affectionate satire of all those 80s teen movies. Central to its likability is the Hill-Channing partnership which, simply, works. Two actors I would never have thought of together and yet they fit perfectly, with Channing bringing plenty of muscle and an unexpected tenderness to Jenko while Hill is shorter, smarter and enjoying being in the cool gang for once in his (well, Schmidt’s) life. The chuckles come thick and fast, from slapstick to the odd in-joke for those who remember all those teen movies from before they were “classics”; though at times Hill and Bacall do rely a touch too heavily on foul language to tickle the old funny bone. There’s a fair bit of action shoehorned in too, as well as a nice play on kids’ mentality today (it’s cool to care) and, of course, a little harmless romance. There’s even a very angry police chief or two and, hey, who doesn’t love a shouty police chief? I’m too young to remember the original 21 Jump Street series on which this is loosely based (cameo alert! ), but I’ve heard it was a rather earnest affair. Fortunately this time round, it’s the funny that wins the day, even if there is a little moral at the heart of it all.